Visiting the south of France! 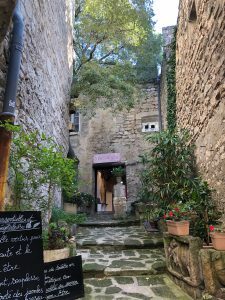 This beautiful little city known as Les Baux-de-Provence located in the south of France boasts in its scenic views of mountains, rivers, and its cobble-stoned streets. It transports you back in time to the 12th century due to its conservation of the city’s past. This hidden gem offers delicious traditional food, a chateau that was built in the 10th century which overlooks the city, and botanical gardens. Along the streets, local vendors promoted their handmade work such as soap, body care, home décor, wine, and candy. It is a very “antique” village and that is what makes it so special. Even though this village attracts over a million tourists a year, there are only approximately 500 inhabitants. Homes could be seen every 100 meters away from each other. They conserve the land and the nature. It was a wonderful experience visiting such a small village, especially since I live in a big city. I became more grateful for the Earth itself and I was able to get a glimpse of what life was like in the past. After, we headed towards Avignon, a much bigger city with a great historical past. 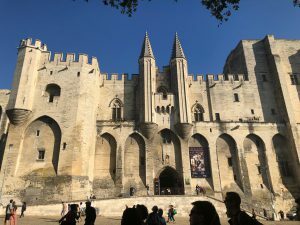 Avignon is located in the south of France as well and is surrounded by the Rhone River. This city is better known for its Palais des Papes, which translates to the Popes’ Palace. 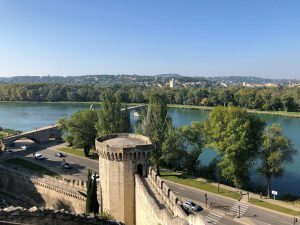 During the 14th century, Rome was undergoing some difficulties and oppression which led to the Pope at the time, Clement V, to move to Avignon. This was where six successive popes lived from 1309 to 1377. We visited the palace and walked through the rooms where the Pope would host meetings, pray, and cook dinner. We went up to the top of the palace, which overlooked the city and a beautiful view. Finally, we headed towards a small garden where we enjoyed barbe à papa (cotton candy). This weekend trip was delightful, humbling, and joyful. It was amazing to be able to escape the stress of modern life and the rush of one’s schedule. “A work of art which did not begin in emotion is not art.” – Paul Cezanne. The Post-impressionist painter was born in the late 1800’s and highly impacted the transition of the art evolution during the 19th century. Paul Cezanne was a French artist who was born and lived most of his life in Aix-en-Provence, France, a very colorful city located in the southeast of France just a few miles from the Mediterranean Sea. 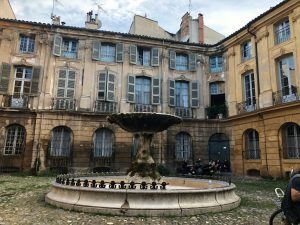 Aix-en-Provence has preserved Cezanne’s story and continues to embrace his achievement even years after his death. After a two-hour city tour, I witnessed plenty of beautiful water fountains found all throughout the city. 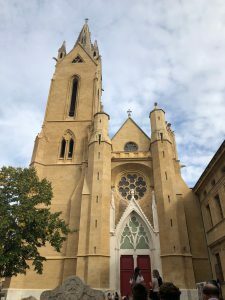 The city was filled with Medieval architecture, bright clay-like buildings, and stone churches. 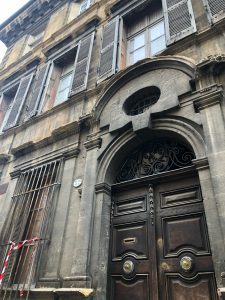 We walked past the Ancien College Royal de Bourbon, a school founded by Henry IV in 1603 which Paul Cezanne was a student of. We came across the church of La Madeline, where Cezanne’s funeral was held. He died the 23rd of October in 1906. The building that once used to be his home currently inhabits other locals. Cezanne grew up with a passion to display his thoughts and emotions through art, something his father was against. Cezanne’s father was a successful man who had enough economic wealth to support his son, but he did not because his father wanted Cezanne to study law and become a lawyer. Some of his well-known artworks include Apples and Oranges (1900), The Lac d’Annecy (1896), and The Kiss of the Muse (1860). 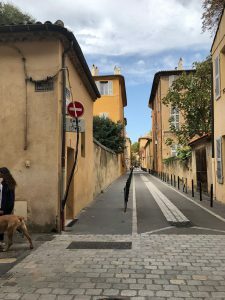 Aix-en-Provence is currently a bright welcoming city. Locals are very friendly, and they encourage tourists to engage in the French culture. It is a diverse city containing stores and restaurants specializing in different cuisine and fashion such as Japanese and Italian. The city center has a lot to offer. Street performers are out singing, dancing, or playing music. Local businesses sell original handmade soaps, jewelry, clothing, and food on the weekends. Aix-en-Provence specializes in a special treat known as Calissons, a chewy treat made from almonds and oranges. Aix certainly was one of the liveliest cities I have visited this semester. This past weekend we had an excursion to the wonderful city of Annecy, known by many as “Little Venice”. The villa was vibrant with its historical architecture and the French Alps in the background were certainly a view. 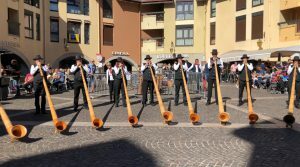 I was blessed enough to have visited Annecy for a very traditional festival known as The Return From the Alpine Pastures. The streets were filled with tourists from all over France and all over the world to try to get a glimpse of French tradition. Shops all over Annecy were opened, food stands were located every 20 feet, and music could be heard all throughout town. 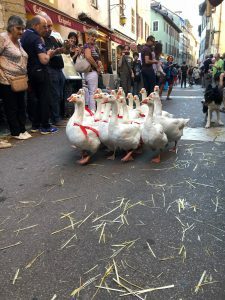 The festival consisted of a parade all over Annecy and included numerous amounts of animals such as cows, donkeys, geese, dogs, and horses. Here is a picture of the boldest and most powerful geese I have ever seen walk along the streets of Annecy. The parade features and holds on to the tradition of bringing in the cattle and other animals back from the pastures where they have been all summer long. Also, it consisted of traditional French folk music and attire. People of all ages were speculating over the entertainment and festivities being held. There was a concert as part of the festival which I was lucky enough to be front row. Besides the parade, the Annecy lake was beyond gorgeous and inviting due to its clean and glistening water. Bridges spread from one side of the lake to the other and Annecy’s warm climate made it all a great experience. The weather was so great people headed over to paddle board or simply jump in the water. 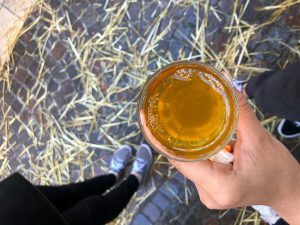 One of the things I tried while in Annecy was its apple cider. Not only was it delicious but only .50 euros! 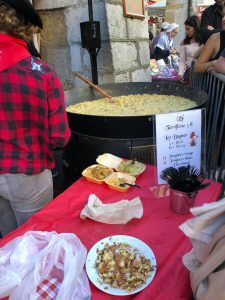 In addition, I tried a well-known dish called Tartiflette, which is a creamy mix of potatoes, cheese, and ham. Tartiflette is a very popular dish often eaten by many during the winter. The line was so long but worth the wait! I highly recommend trying this dish if you ever get the chance to go. 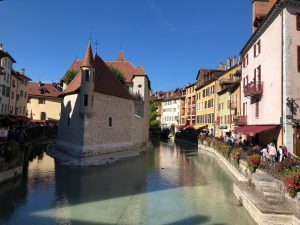 Annecy was a unique city because it maintained onto old customs and strongly embraced their ancestor’s values. 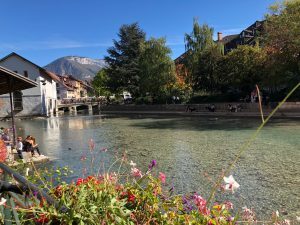 I was able to get a glimpse of what Annecy was before and what it is today. Even through its architecture, it resembled French lifestyle from the past. There are people who make a living from herding their own cattle and planting their own crops. There were kids herding their animals and fathers driving their tractors. Family businesses were promoting their home-grown and local recipes. Home made soaps, honey, bread, and jewelry were out on display. It was beautiful to see people go out and share with others their traditional desserts, dishes, attires, and music with those who come from a world different than theirs. For the first time, I saw musical instruments that I had never even imagined, which were typical to French music. The city was crowded, and it was a beautiful sight to see people from different backgrounds unite and engage in this parade. France is more than just berets and baguettes, it is unity, freedom, pride, and love for the seed planted by their ancestors. Salut! It is with great pleasure I get to say I finally realized my childhood dream to travel to Paris. 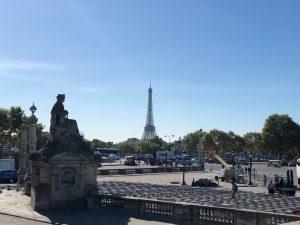 While I was only there for three and a half days, I was able to see almost everything Paris has to offer, including the Eiffel Tower, the Arc de Triomphe, the Musee D’Orsay, and the Seine River. 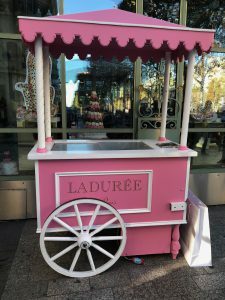 Paris is a beautiful city with unique street vendors, its own style in fashion, and mesmerizing architecture. 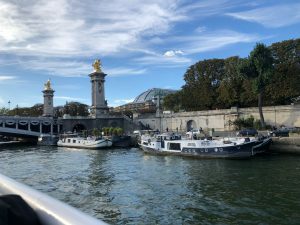 Upon arriving to Paris, we first headed over to the Seine River for a boat tour of the city. We came across the Notre-Dame, Pont Neuf, and the Grand Palais. The Pont des Arts, known as the Love Lock Bridge, is a symbolic image for Paris’ romantic side. Couples come daily to the bridge to profess their love for one another by placing locks on the bridge and throwing the key into the river. 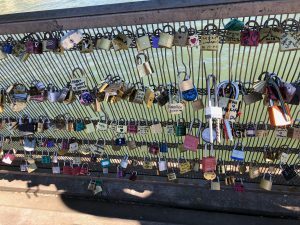 Since the number of locks on the bridge kept increasing every single day, it began to impact the bridge’s weight and the French government intervened by removing the locks to prevent a collapse. I was able to see a lot of locks, but not as many as there were before. 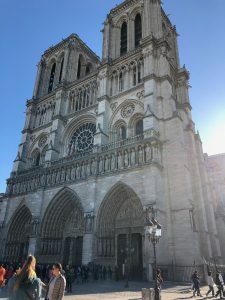 Next, we headed over to the Notre-Dame Cathedral, a marvelous piece of art. 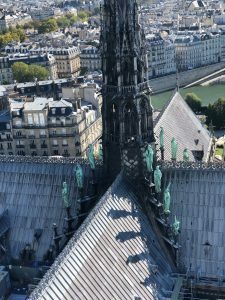 The Cathedral has a very strong French Gothic architecture and that was seen through statues of goblins located all over the Cathedral. It was during the time of its construction that goblins were believed to send away evil spirits, thus the reason goblins are often seen architecture built during this era. 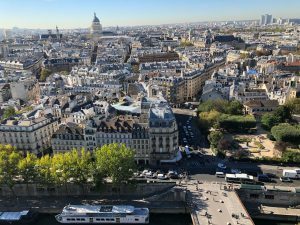 Then, we climbed approximately 300 stairs to the top, one of the heftiest workouts yet, but was greeted with a panorama of Paris at the end. 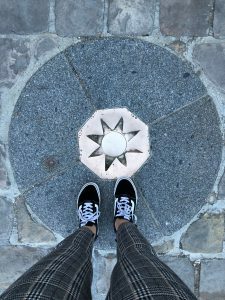 Located in front of the church was Point Zero, a very particular point in Paris used to measure the distance from other cities. We later visited the Louvre where we saw many unique and well-known pieces of art including, the Mona Lisa, the Venus de Milo, The Wedding at Cana, and The Coronation of Napoleon. All perfect and unique in their own way. The history of the Louvre is a fascinating one. It all started with king Phillip Auguste who decided he wanted to build a type of fortress to protect Paris. He built his own castle with defensive towers and the remains can be found in the Louvre to this day. 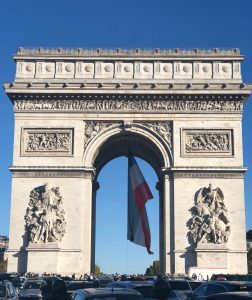 The Arc de Triomphe was another attraction we visited and is located at the end of the Champs-Élysées which is a part of the city filled with shopping centers and restaurants. It includes a variety of name brand stores such as Hugo Boss, Louis Vuitton, and Longchamp. We witnessed various newlyweds having a photoshoot in front of the Arc de Triomphe. However, finding a spot for a picture was almost impossible. It was very crowded the people began forming a line right in between both car lanes leading towards the rotary surrounding the Arc de Triomphe to take the perfect picture. 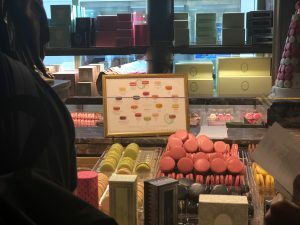 To end our day, we headed over to LaDurée, a pastry shop known for its tea and macaroons, found near the Champs-Élysées. The macaroons were a bit pricey compared to other pastry shops, but the macaroons were beyond delicious. The shop had two floors, mirrored walls, fancy bathrooms, and two function rooms. 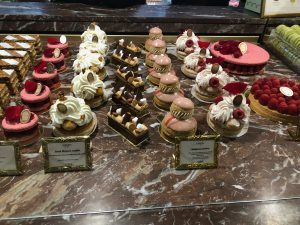 LaDurée has other pastries as well such as cakes, tartes, and chocolate specialties. I highly recommend the vanilla flavored macaroon! Paris was a dream! 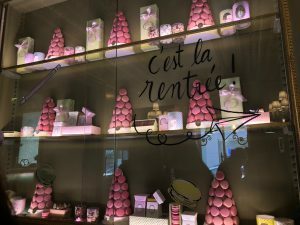 The best places to go in Paris are to local shops and restaurants because it is the best way to fully immerse into the French culture. I have only been in France for about a week but I have already fallen in love with the music, entertainment, food, and people. Hello! My name is Daisy and I am pursuing a Philosophy major and a French minor. Due to this, it only seemed right to fulfill my academic requirements in none other, than France. I am a junior at The University of Massachusetts, Lowell and this is the first time I will be living outside of the United States. If anyone is interested in studying abroad, I highly recommend starting right away as this is a long and tedious process. It’s very important to put into consideration whether the school you are attending will be able to transfer over the credits from your host university. Also, depending on the program, it may be required to obtain a visa. It may be necessary to speak with your professor and academic advisor. 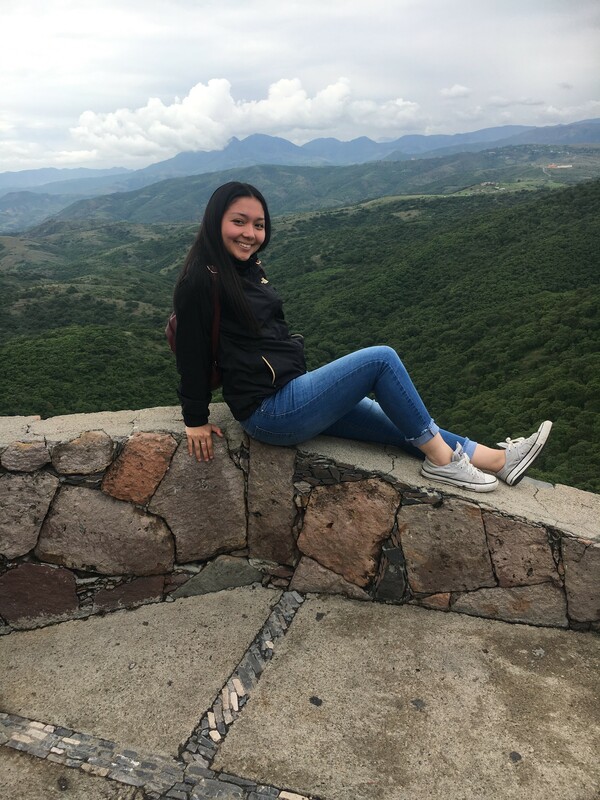 Deciding to study abroad was a difficult choice simply because I would have to leave everything behind for a few months like my family and friends. I had to put on pause all the activities I currently partake in. There were a lot of sacrifices, but I know it will all be worth it in the end. I began taking French lessons in middle school and continued throughout high school, and now college. I remember seeing the Eiffel Tower, small coffee shops, the Louvre, and many other French attractions in my French book. Slowly, I began falling in love with the French language and grammar. I began to enjoy learning about the French culture. While in college, I saw the opportunity to study abroad in France and I took it. The program I found will be focused on the French language and is the perfect program to help me pursue my French minor. I chose to live in a home-stay to immerse myself into the culture and to perfect my French. I cannot wait to arrive to France and continue my academic journey with you all! 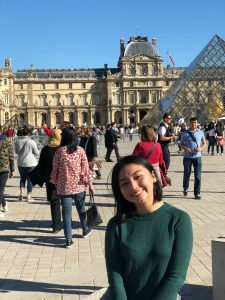 Follow this Fall 2018’s Office of Study Abroad & International Experiences Global Correspondent, Daisy Angel, on her studies in Grenoble, France! 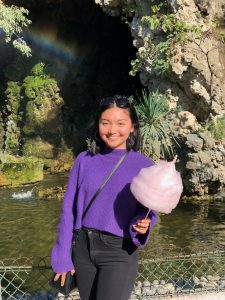 Daisy is a UMass Lowell Philosophy major with a French minor studying this summer on a UMass Lowell Partner-led API in Grenoble, France: Université Grenoble Alpes, Intensive Language Studies. 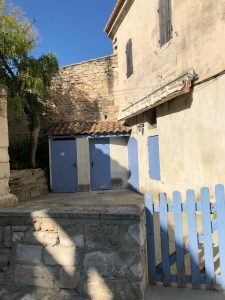 You can also read blogs from other trips to France and all across the globe!